Mrs. Mamie Lee Williams, age 83 of Bowdon, Georgia, passed away on Saturday morning, January 12, 2019. She was born July 8, 1935 in Jonesboro, Clayton County, Georgia, the daughter of the late William “Andy” McIntyre and the late Johnnie Kate Brooks McIntyre. She was retired from Circuit City, having worked in sales for more than fifteen years. 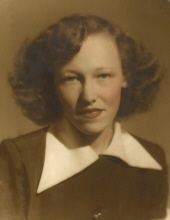 In addition to her parents, she was preceded in death by a daughter, Lyndia Diane Williams in 2014; two sisters: Mary Lou Chambers and Lucy Thompson; brothers: Hoyt McIntyre, Horace McIntyre, and Herbert McIntyre; and a grandchild, Auston Rooker. Survivors include her husband of 68 years, Rev. Charles Williams; daughters: Debbie Ashmore and her husband, Ken, of Carrollton, Georgia, Connie Baggett and her husband, Harl, of Tallapoosa, Georgia, and Treasa Rooker and her husband, Johnny, of Villa Rica, Georgia; son, Chuck Williams and his wife, Lea, of Lakeland, Florida; six grandchildren; and one great grandson. Funeral services will be conducted Monday, January 14, 2019 at 2:00 PM from Martin & Hightower Heritage Chapel with Pastor Joe Driver officiating. The following gentlemen will serve as pallbearers: Haynes Driver, Brian Blalock, Johnny Rooker, Kevin Daniel, Ken Ashmore, and Benjamin Ashmore. Interment will follow in Carroll Memory Gardens. The family will receive friends at the funeral home on Monday from 12:00 Noon until the hour of service. Messages of condolence may be sent to the family at www.martin-hightower.com. Martin & Hightower Heritage Chapel has charge of the arrangements. To send flowers or a remembrance gift to the family of Mamie Lee Williams, please visit our Tribute Store. "Email Address" would like to share the life celebration of Mamie Lee Williams. Click on the "link" to go to share a favorite memory or leave a condolence message for the family.